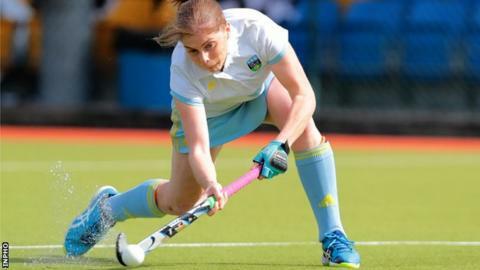 There were wins for the top four in the Women's Irish Hockey League on Saturday as UCD, Cork Harlequins, Pegasus and Railway Union all recorded victories. The only change in the top half of the table saw Ards, thanks to their 2-1 win over Monkstown, leapfrog Ulster rivals Belfast Harlequins into fifth place. Ulster's Katie Mullan scored a late winner for leaders UCD as they beat Loreto 1-0. Defending champions UCD stay four points clear of Cork Harlequins. Ireland captain Mullan netted with a drag flick finish from a penalty corner. Munster side Cork Harlequins got the better of a seven-goal thriller with Belfast Harlequins, winning 4-3. Irish internationals Naomi Carroll and Rebecca Barry were among the scorers for Cork with the goals for Harlequins coming from Laura Johnston and two for Katherine Welshman. Pegasus continued their good season with a 2-0 home win over Pembroke Wanderers. Both goals came in the first half from Stephanie Quinn and Ruth Maguire and were the result of penalty corners. Railway Union had a comfortable 2-0 success at Trinity College with Kate Lloyd grabbing both goals. They remain in fourth place, six points behind Pegasus. Ards came from behind to defeat Monkstown at Londonderry Park, thanks to second-half efforts from Amy Benson and Kerry Harvey. It keeps their hopes alive for an end of season play-off place.